Bird's Beak - for peeling any round fruit or vegatable. Chef"s - use as a miniature cook's knife. Don't hesitate to bring your fingers up onto the blade for fine work. Sheep's foot - this unique parer has a straight cutting blade. 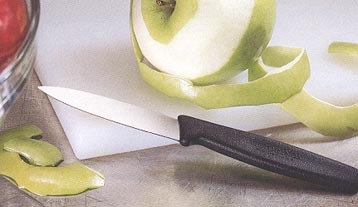 Wavy Edge - use when you need to cut a crust or skin with a soft inside. Perfect for tomatoes.